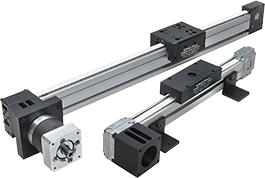 Del-Tron offers a wide range of linear positioners. These micrometer positioning stages and crossed roller positioning stages are available with travels ranging from .25” to 2.0”. All of are linear positioners are available in X, XY and XYZ configurations and can carry loads ranging from 4 lbs on our miniature ball slide series all the way up to 160 lbs on our crossed roller positioning stages. All model numbers are available with inch or metric micrometers and mounting holes. Most models are available with locking micrometers and all models can be supplied with our Posi-Lock friction locking mechanism to secure the table. We also offer the SD Series (side drive mounted micrometers) designed for applications requiring the smallest footprint possible. Positioning accuracies range from 0.0005” per inch of travel straight line accuracy on our ball slide positioning stages to 0.0001” per inch of travel straight line accuracy on our crossed roller positioning stages. Additional industry terms include manual stages, manual linear stages, positioning stages, manual linear positioners, linear positioners, XY stages, micrometer slides, roller tables, linear translation stages, and more generally as linear slides, linear actuators or motion slides.